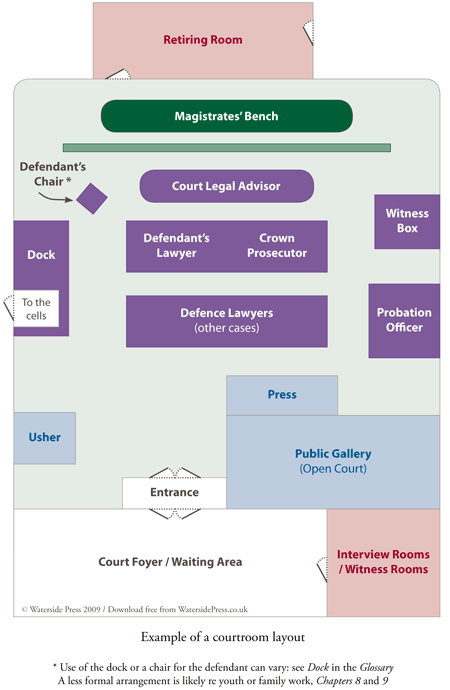 This is a simplified view of a typical magistrates' court layout. Most courtrooms are fairly similar, featuring the central and dominant magistrates' bench (which is often raised on a platform). Between this and the lawyers tables for the prosecution and defence there is space for the court legal advisor. To one side there is the dock, or alternatively a chair for the defendant - the use can vary (see Dock in the Glossary). For security, defendants in custody usually arrive through the cells. Witnesses are called to their own stand. Other designated areas are for a probation officer, court usher, press and general public (in open court). Outside the courtroom there will be a foyer and rooms for witnesses and interviewing. 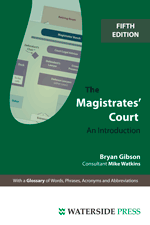 This diagram is taken from The Magistrates' Court: An Introduction (5th Edition May 2009) by Bryan Gibson and Mike Watkins.